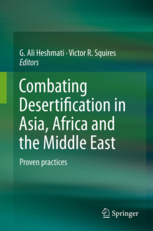 This book of 21 chapters is about the ‘how’ of desertification control as opposed to an analysis of the ‘why’ and fills a gap in the desertification-related literature in that it shows what to do in situations ranging from fixing mobile sands to arresting accelerated soil erosion in sloping lands. More than 40 years of work by the Chinese in sandy land reclamation has led to the development of effective techniques. There are numerous illustrations (many in color) to show the successful techniques. This compilation demonstrates that desertification and land degradation can be controlled and reversed with existing techniques in such widely varying environments as the Sahel of Africa to Sri Lanka and the Philippines in SE Asia, from high elevation in Lesotho to low lands on desert margins in Mongolia. Proven approaches include technical interventions, changes in governance and to the legislative framework and policy reform. The contributors are local experts working in-country and bring to the book insights into many little-known aspects of the technical, ecological, social, cultural and economic factors determine success or failure of desertification control efforts. This book will be of great value to professionals from the donor community (World Bank, Asian Development Bank, Islamic Development Bank, UN agencies and NGOs) to graduate student students and land managers tasked with responsibility to arrest and reverse desertification and land degradation.